Every individual and family living with a disability has unique issues that challenge them every day. Worrying about having to pay for a much-needed service shouldn’t be one of them. Jewish Family and Children’s Service of Greater Philadelphia knows how critical it is to help people who are living with disabilities set goals and be able to achieve them. If that requires a specialized service that isn’t in a family’s budget, we can help. 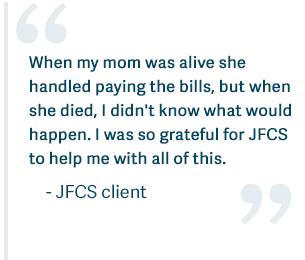 Crisis assistance: when emergencies and the unexpected strike JFCS is able to help with rent, utilities, and clothing. Basic needs: for some clients, it’s a struggle just to take care of basic monthly expenses. For those families JFCS has special funds that can assist with basic needs. Assistance with camp: the camp experience can be extremely beneficial for individuals with disabilities; JFCS can help qualified families take advantage of camp programs. Assistance for needed evaluations in order to obtain benefits and entitlements. Subsidized services based on need. We can help you complete applications for grants and benefits. We can help with estate planning so you can be sure your loved one is cared for.